Trinidad and Tobago national team defender Arin King was supposed to join teammates Maylee Attin-Johnon and Tasha St Louis in the post-game press conference yesterday but never made it. It was, arguably, the only time King missed her cue on Tuesday night. 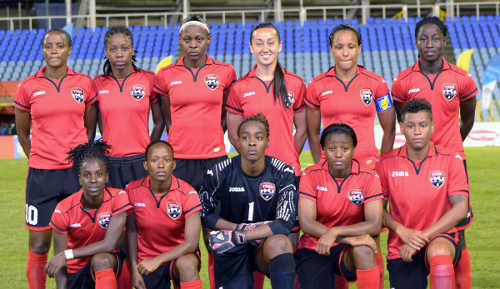 Photo: Defender Arin King (third from left) was instrumental in Trinidad and Tobago Caribbean Cup title win last night. In the inaugural Women’s Caribbean Cup’s tense final at the Hasely Crawford Stadium, Port of Spain, it was Trinidad and Tobago’s rearguard—rather than its celebrated offence—that made the difference as the “Soca Princesses” successfully defended an early Mariah Shade strike to edge Jamaica 1-0. At the final whistle, the Princesses had completed the entire four-game tournament without conceding a single goal. But goalkeeper Kimika Forbes’ clean sheet was the only thing last night’s triumph had in common with Trinidad and Tobago’s lopsided earlier fixtures. “I am very excited to get the win,” said Trinidad and Tobago’s coach Randy Waldrum. “It was a very difficult game for us… It wasn’t out best performance by any means but we needed a game like this tonight so we could find out the areas we need to work on. Team captain Maylee Attin-Johnson saw the positive side of an ugly win as well. 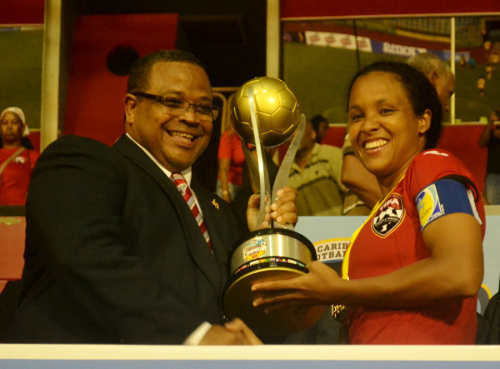 Photo: Trinidad and Tobago captain Maylee Attin-Johnson (right) collects the Caribbean Cup trophy from CFU president Gordon Derrick. After dancing past their group opponents, led by Kennya Cordner’s pizzazz and the scoring boots of St Louis and Shade, about 3,000 fans came out to see the Princesses sashay past fierce regional rival, Jamaica, and over the finish line. It did not quite work out that way. The Caribbean Cup did not kick off; it exploded into life. But it was the “Reggae Girlz” who lit the fuse. 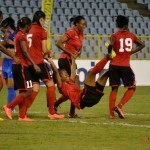 Deep-lying Trinidad and Tobago midfielder Karyn “Baby” Forbes gave the ball away from the touch with a poorly executed long, diagonal ball. And, within 36 seconds, King and the equally impressive Rhea Belgrave were forced into two desperate, full stretch tackles as speedy Jamaican striker Shakira Duncan and her industrious foil, Christina Murray, bore down on the opposing goal. In less than a minute, the Princesses had probably faced more offensive menace than they did in the previous 270 minutes of tournament play. 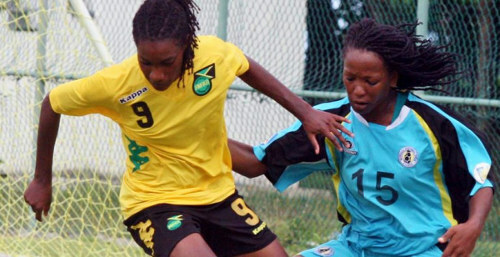 Photo: Jamaica striker Shakira Duncan takes on a St Lucian opponent in a previous contest. Duncan was a constant threat last night. Cordner touched the ball in earnest for the first time in the third minute and was immediately felled, near the centre of the field, by a flurry of tackles from Murray and midfield enforced Nicole Campbell-Green. This final, one sensed, would be a tasty and testy one. And then, just like that, the Princesses were ahead. In the eighth minute, Cordner won an inch on the left flank and threaded a pass to St Louis on top the Jamaican box. Janine Francois, always a willing runner darted into space to her right for the obvious pass. But St Louis ignored her and lofted the ball over the opposing defence and into the path of Shade’s trademark diagonal dash. And Shade held her nerve to blast into the far corner for her sixth goal of the competition, which was just one shy of the seven from eventual top scorer and teammate, St Louis. 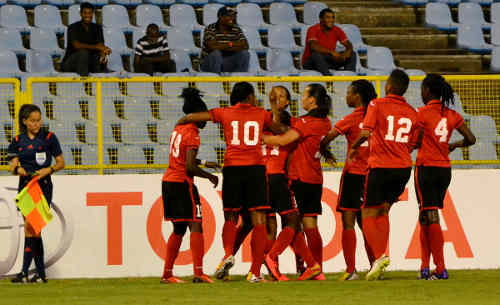 Photo: Trinidad and Tobago celebrates Mariah Shade’s opening Caribbean Cup final goal against Jamaica. Jamaica’s response was almost immediate. Two minutes later, left back Monique Pryce drove a ball though the host team’s backline for Duncan only for a sliding King to make an inch-perfect challenge. Trinidad and Tobago got the trophy—its first senior title in 13 years—but, tactically, Jamaica coach Merron Gordon might feel his Girlz were superior. 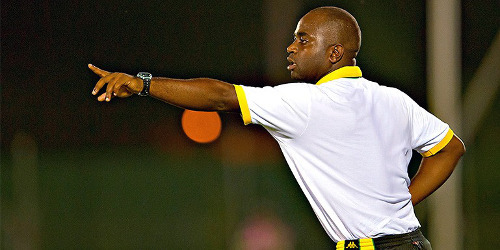 Photo: Jamaican coach Merron Gordon has graduated from his country’s youth to senior ranks. There was some vindication in TTFA general secretary Sheldon Phillips’ decision to recruit Waldrum last night as the United States coach led the Princesses to the Caribbean title. For the first time in the tournament, Phillips showed up at yesterday’s post-game press conference accompanied by president Raymond Tim Kee. 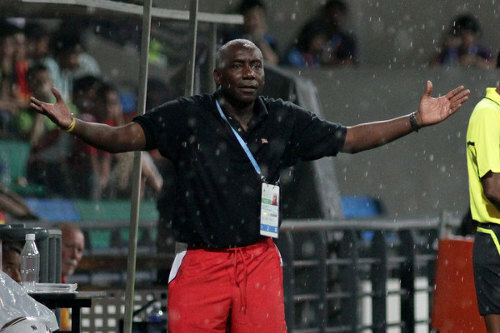 But Gordon, a Jamaican on his first assignment as senior coach after three years with the junior teams, arguably provided a counter-argument that the Caribbean is not devoid of tactical minds. It is worth noting too that Bertille St Clair took Trinidad and Tobago to the 1991 Under-20 World Cup and Anton Corneal, the TTFA’s last technical director who quit after three years without pay, helped steer the young “Soca Warriors” to the 2007 Under-17 and 2009 Under-20 World Cups. Are Trinidad and Tobago’s coaches seen as anything more than cheap labour who must toil unpaid until the TTFA finds a foreigner willing to take their jobs? Photo: Former Trinidad and Tobago national women’s team head coach Marlon Charles has accepted a post as Randy Waldrum’s understudy. It is a debate worth having at some juncture. 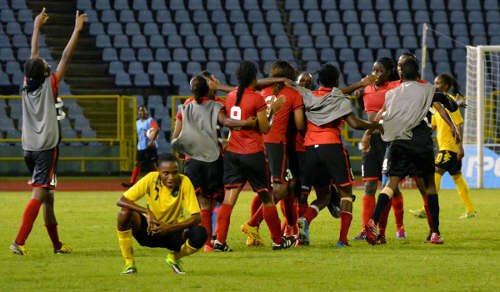 But, for now, it is better to appreciate the efforts of the young women in red, black and white strip who defied everything Jamaica threw at them. By halftime, King and Belgrave had executed a combined six decisive tackles on Duncan—including one lunge each inside their own penalty box—while Murray lashed one effort wide from on top of the Trinidad and Tobago area after she pounced on a short pass meant for Attin-Johnson. How long could King and Belgrave keep this up? Before the game, Waldrum suggested that his central defenders’ intelligence would be key in deciding when to press high or drop deep to cater for the pacey Jamaican frontline. But, collectively, he did not think his team found the right answer against Gordon’s Girlz. 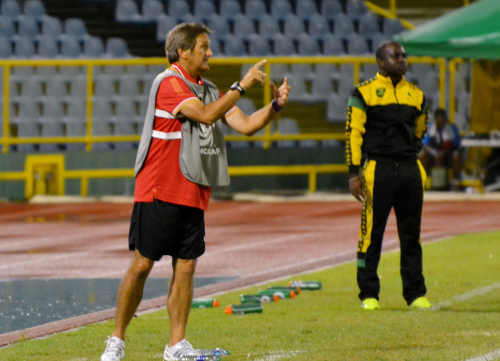 Photo: Trinidad and Tobago coach Randy Waldrum (left) makes a point while Jamaican coach Merron Gordon looks on. In the 50th minute, Campbell-Green stole from Francois and found Donnakay Henry who crossed from the left flank. King tried to block the danger but, inadvertently, turned the ball against her own upright. It was as close as Jamaica came to an equaliser although Trinidad and Tobago goalkeeper Kimika Forbes, sister to the Princesses’ key midfielder, did need to make two vital second half saves. 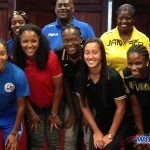 There was late pressure as Jamaica targeted rookie defender Taylor Mims, who made her first appearance of the tournament in the 80th minute for exhausted right back Patrice Superville. It was the fourth right back T&T used this tournament as Belgrave started there before shuffling inside to replace the injured Ayanna Russell; while the second choice full back, spritely teenager Khadidra Debesette, succumbed to a back injury in the previous fixture. But Trinidad and Tobago stood resolute. Photo: Trinidad and Tobago goalkeeper Kimika Forbes pushed an effort over bar during the Caribbean Cup final against Jamaica. “We didn’t execute (our plan) well but we stayed in the game,” said St Louis. St Louis agreed that perspiration, more than inspiration, had given Trinidad and Tobago the Caribbean Cup crown. Now, the Trinidad and Tobago women want something back. 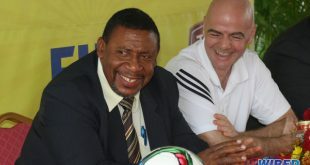 They want the support necessary to allow them to prepare properly for October’s CONCACAF tournament in the United States. 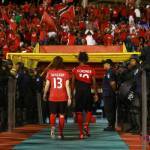 Trinidad and Tobago, Jamaica, Haiti and Martinique, will compete with host nation, the United States, as well as Mexico, Costa Rica and Guatemala for three automatic Canada 2015 World Cup spots plus one play-off berth. Photo: Trinidad and Tobago celebrates its Caribbean Cup final win over Jamaica. Waldrum, who also coached the bottom placed United States’ National Women Soccer League (NWSL) club Houston Dash, will remain with the Princesses until then. Waldrum, according to the TTFA, coached Trinidad and Tobago free of charge at the Caribbean Cup. There is no word so far as to what his financial package is for the next two months; or who is paying it. But, undoubtedly, the Princesses will need money. Attin-Johnson said the women were encouraged by athletes like golden World Championship hurdler Jehue Gordon, who succeeded despite minimal support from corporate Trinidad and Tobago. She hopes the Princesses get the necessary aid but vowed that they would not let anything stand in their way. Photo: The Trinidad and Tobago starting team for the 2014 Caribbean Cup final. The Princesses should have Sweden-based attacker Ahkeela Mollon in their ranks by October and a frontline of Mollon, Cordner and Shade—serviced by Attin-Johnson, St Louis and Karyn Forbes—is an intimidating one on paper. Spare a thought, though, for the alert, decisive defensive display from King and Belgrave that brought Trinidad and Tobago its first senior football trophy in 13 years. Striker Mariah Shade’s decisive goals and selfless performances earned her the accolade as the Caribbean Cup’s Most Valuable Player. But it was King and Belgrave who ensured the most important award, the Caribbean Cup trophy, stayed in Port of Spain. Trinidad and Tobago (4-2-1-3): 1.Kimika Forbes (GK); 15.Patrice Superville (17.Taylor Mims 80), 4.Rhea Belgrave, 5.Arin King, 12.Lauryn Hutchinson; 9.Maylee Attin-Johnson (captain), 14.Karyn Forbes; 11.Janine Francois (7.Dernelle Mascall 69); 3.Mariah Shade (13.Shenelle Henry 74), 10.Tasha St Louis, 19.Kennya Cordner. 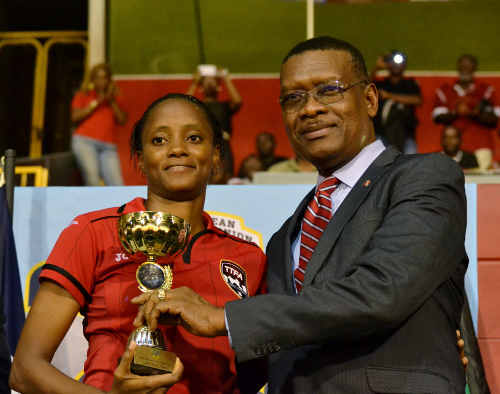 Photo: Trinidad and Tobago attacker Tasha St Louis (left) collects her prize as Caribbean Cup top scorer from TTFA president Raymond Tim Kee. Jamaica (4-2-3-1): 13.Nicole McClure (GK); 12.Sashana Campbell, 18.Sherona Forrester, 6.Alicia Wilson (captain), 3.Monique Pryce; 17.Nicole Campbell-Green, 20.Jodi-Ann McGregor; 8.Kenesha Reid (15.Shaneka Gordon 56), 11.Christina Murray (7.Venecia Reid 69), 4.Donnakay Henry; 9.Shakira Duncan (5.Mitsy Facey 78). Unused substitutes: 23.Olivia Reid (GK), 10.Trudian Mills, 14.Alexa Allen, 16.Yolanda Hamilton, 19.Myjnairii Perkins, 22.Khedine Salmon. 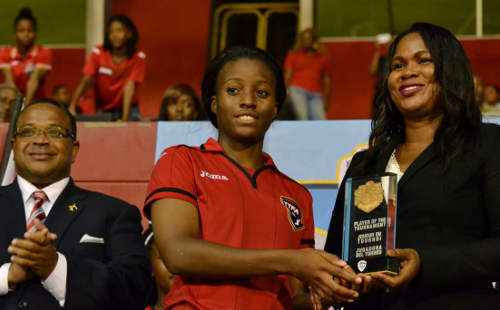 Photo: Trinidad and Tobago attacker Mariah Shade (centre) collects her Caribbean Cup MVP award from CFU executive member Sonia Bien-Aime (right) while CFU president Gordon Derrick looks on. 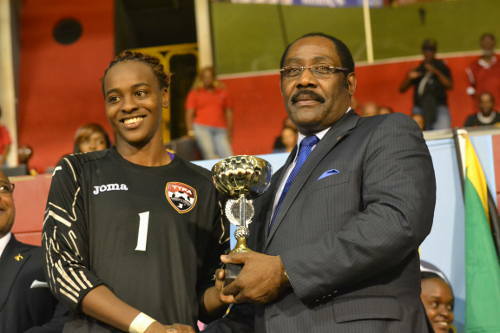 Photo: Trinidad and Tobago goalkeeper Kimika Forbes (left) receives the Caribbean Cup Best Goalkeeper prize from CFU executive member Horace Burrell. From where I was standing, Gary hector is almost right with King coming into the midfield. I agree with Waldrum that the team is playing a little too slow when moving going forward. Karyn can stay in midfield yet King has to be given the chance to push as a libero and execute ten to fifteen yard passes to the edge of the box. when she goes up, she almost restrains herself. If this is adjusted, then the team would be at least be two yards quicker. When I saw games being won before half time and Charles did not move king forward or baby as a striker or even give bench players including the sub keeper a sweat (maybe I missed it), I thought wtf(ootball) is going on! why are the key players being risked, clearly, to play in the finals? Is this ego or is the bench soo awful? Shari John has a point, but who is responsible for having a national Coaches Association? Waldrum? I commend all who have played their part in women’s football. When I cannot tell if the bench’s quality is even half as good as the players on the field in a “local” tournament, I at least give a chance to any assistance being given to assure me that there are more than one player who can fill a position on the field effectively on the world stage. And this is from where I am sitting. You are spot on, Shari John. Randy Waldrum must have seen the talent so he knew it would be an easy road ahead and most people would be none the wiser as to who laid the foundation. Sana sana sana!! Shari shari shari!! 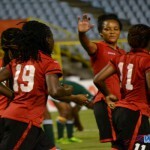 As I keep saying – MARLON CHARLES IS THE REASON BEHIND THE SUCCESS OF WOMEN’S FOOTBALL IN T&T!!! He was here before Pellerud, after Pellers and all now. Does Marlon even get paid? It is a real shame that Waldrum will get the credit for the success of a team that is where they are because of the tireless dedication of others. A man cannot come in two weeks and take a team to a world cup. This is the result of years of toiling with no recognition. Years of ensuring that there was an U13, U15, U17 and senior program continuously. This is the result of WoLF. This has NOTHING to do with Waldrum. People like Charles, Shabazz, and Jinelle James should all stand up. This is the result of their hard work among others. That is the elephant in the room Sheldon Scipio. Marlon Charles won the CFU at Under-15 level just last year. This exercise was ridiculous in my humble opinion. Ask yourself how much attention did the Team get while he was focused on his Team and the tournament that caused him to miss the first game, and send his son to coach in his place, Also consider only half the team visited him. I can go on, but T&T would have qualified and won this without foreign help. As someone who was in the middle and around this, this is not good at all. Bertille St Clair once turned down the post as assistant coach for a foreigner. Because he said if you can find money to pay him, you can find money to pay me. They sent back for him eventually went back to him and made him coach. The first time they were late paying him, he famously hopped on a plane back to Tobago and they had to pay him to come back. In some respects, he went on to be the most successful local coach we had. And no one, not even Beenhakker, took the team as far as him in the Concacaf Gold Cup. Kudos to this coach for taking the team under his wing without a salary but many local sporting associations do not appreciate our local coaches even if they are qualified and willing to work with our teams. They are just not prepared to pay them for their services but will always find the exorbitant sums to pay foreign coaches. I know local coaches who have worked for years with gold medal winning teams in another sport and have never been paid one red cent for their services while foreign coaches were being handsomely paid. It is not just a TTFA mentality. Randy Waldrum will need to be paid now as his right. If TTFA respects the rest of the coaching staff, they will be offered some sort of remuneration too. If the rest of the coaching staff respects themselves, they will surely think their time and effort is worth something too. Most of the local coaches see this as a duty of love. But that puts them in a cycle of abuse that is hard to get out of. Apart from it being such a comprehensive report this stood out to me the most.. ‘Are Trinidad and Tobago’s coaches seen as anything more than cheap labour who must toil unpaid until the TTFA finds a foreigner willing to take their jobs?’ this really has been the notion for quite some time, i think we should have a local coach as an assistant or closely kept in the circle to avoid any vacuum effect after departure of the foreign coaches. I think alot can be learnt during that time preparation to competition. Thanks for the Independence gift. Well done Soca Princesses. Well, you never know if we might need an extra defender in the midfield. But Ayanna Russell did okay in that role. Arin and Rhea looked like the twin towers. I don’t wanna break that up if I can help it. I would like to see more Trinis break into the women’s league. Houston finished rock bottom. If Waldrum doesn’t sign anyone for next season, that would say something. I don’t think King has Karyn’s passing range, Gary Hector. I don’t think anyone in the term serves the ball as well over distance as Karyn. And then there are Karyn’s set pieces to consider too. The US women’s team is one of the best in the world. I don’t think you bridge that sort of gap in a few weeks or even a few years. It would be like the Soca Warriors hoping to beat Argentina by January. Sure, we can aim to be as good as anyone. But I don’t think it realistic by October. @Prince Borde…If we want to be the best we have to beat the best. Avoid ing the US will not our cause in reaching where we want to but may just give us a false sense of achievement. It’s time we start taking on the so-called big guns and show them we can compete with them on equal footing. I hope we avoid the US in the next stage. But then again if we get the US and finish in a semi final position we would not have to play them in the Semi finals. Once we get the job done. It will be no easy task. I believe if Nigeria youth women team can make a finals of a U20 World Cup why not us. The TTFA should be doing everything possible to find the necessary resources for all national coaches and teams. Not just handpicked ones. The women’s team deserves as much help as possible as they are through to CONCACAF. But all teams should feel supported. It is a longer road back for the men because there are more competitive teams in the men’s game. The Soca Warriors have started their fight back though. But now the women must lead the way. Such a shame our men are falling behind…. great game by the T&T team. i found the early first half had highlighted some vulnerability to attacks from the left, but by 30′ that avenue was blocked and we never found a way to tap into it. Seems as though the women preferred the blunt force of the long ball to the crafty surgery of the touches along the flank that produced the goal. To their credit, the Jamaicans turned up the fire in the second half and could have spoiled the party for the home team. With a little bit of luck they could have turned one of those opportunities into goal. Overall, this match could have been about building on success with the kindah swag that turns a win over a gritty—but overmanned—opponent into a workout drill for the next level. Instead, it turned out to be a dogfight that gave the pompeck the feeling that they can bite above their weight. Lesson for the women: Don’t play with your food. Well, all’s well that ends well. Ultimately, nobody cares if you win ugly or you win pretty so long as you win. Here’s hoping the girls can do the same in October. And walk away with the lion’s share of the awards as well.